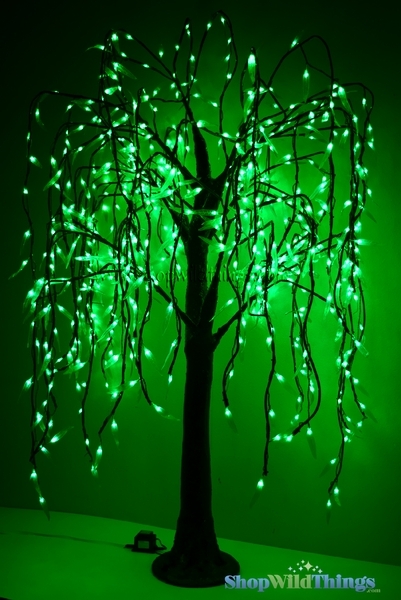 Warm and lush, the green LED lights on this fabulous tree will illuminate any space with a soft, romantic glow. Our spectacular LED Willow Tree is loaded with LED lights inside green leaves and it stands 6' tall by 6' wide. Our high quality LED Trees are popular for both home use and for event and wedding planners alike. Since they can be used both indoors or outdoors, you don't have to worry that pending rain will cause malfunction. Take a look at the video that we took in our studio to appreciate the true beauty and quality of this tree. It's professional grade. Here's what we know about these LED Trees: We use them ourselves, we've opened them, put them together, tested them, photographed them, and know that these trees will knock your socks off. We have sold our LED Trees to several television studios and production companies for award shows. We've sold them to event planners as well. Retail stores love our LED trees for permanent store display because the bulbs last so very long and never get hot to the touch. 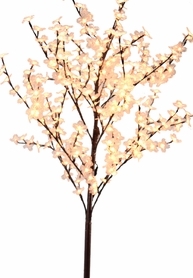 This tree is available with Green Leaves and a Brown Trunk (this one) or with Warm White Lights and a brown trunk. The trunks have a ton of detail and are texturized for a more authentic, 3 dimensional and realistic look. The branch diameters are proportionate to the trunk size, adding to the "natural" look and feel. They are real attention-getters. The base is 5' high with 10" steel bottom plate that is covered by the trunk. Each branch has 55 LED's for a total of 550 LED's on the tree. The branches (10 total) each have 5 bendable limbs and have a sleeve that slides over the trunk attachment and are secured with allen screws. The metal framed limbs support the life-like willow LED Leaves. Each leaf is 3.5" long and they are made out of flexible, texturized material complete with plant-like veins and they nicely disguise the brilliant LED lights held within. Each tree is shipped with 3 lag bolts to mount permanently or just stake them down in soil for your next tent event. If you choose to put in on a table, you will want to weight or secure the base so that it does not topple. With a whopping 550 LED's this tree is bright enough to illuminate just about any room. This tree uses standard 120 volt but only 70 watts and comes with a rainproof AC power adapter with 6' cord. Note: Although this item is Indoor/Outdoor, we do recommend bringing it inside in cases of extreme weather.